I received the new Axis & Allies Anniversary Edition (commemorating Avalon Hill's 50th) for Christmas from my parents (and almost from my wife, too). It is simply amazing! 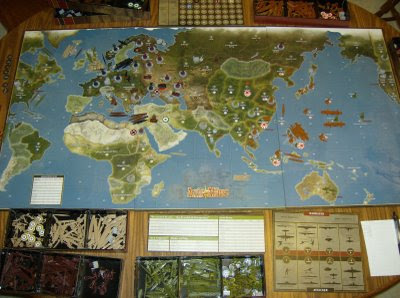 I've been playing Axis & Allies since the mid-80's when it was first published by Milton Bradley. I thoroughly enjoyed the Revised Edition released in 2004, a comprehensive upgrade of the original. I played that version in tournaments and even got it signed by the designer, Larry Harris. I loved it. This one is even better! First off, the board is GIGANTIC, as you can see. The graphic work is excellent, incorporating a topographical quality. There are more territories in key areas (Eastern Europe, China, Soviet Far East). There's even a new spot in Northern France--a likely foothold for an allied invasion. The packaging is magnificent--boxes are included for the units. And all the boxes fit together to form a picture when packed away. Nice touch. Everything is linen-finished, euro-style. The individual unit sculpts return with a few upgrades/changes. Americans now have P-51 Mustangs instead of P-38 Lightnings. Germans have big Tiger tanks with 88s. We also get a new unit: the cruiser. The rules have also been improved significantly. The 2004 Revised Edition brought the game light-years ahead of the MB version, but Mr. Harris has taken this opportunity to fix nearly every single gripe and issue. The sub rules are masterful (they can be ignored by surface ships). The new 0-defense transport is perfect. The lowered unit costs should add more units into the fray. The research scheme is forgiving and enticing. The national bonuses inject pure history into the game. And the 1941 starting setup puts you right on the front lines. I believe the moment I completely fell in love with this game was when I first placed those 2 fully-loaded Japanese aircraft carriers in the same sea zone! My Japanese turn was spent trying to put together an invasion of the Philippines and/or a fighter attack on Pearl Harbor (can you say historical accuracy?). This version includes Italy as a separate power, which seems to work well. It also brings in Chinese forces. These are controlled by the US player, but they get new units (all infantry) based on the number of Chinese territories they control. China becomes a living, breathing beast that Japan cannot afford to ignore. This new reality affects the entire Pacific theater. I was pleased to find my buddy's name in the playtester credits. 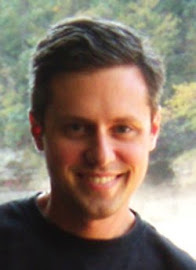 Greg Smorey has done just about as much for the Axis & Allies franchise as any other non-paid fan. He runs several tournaments every year. I look forward to facing off with the pros over this new and exciting version of one of the greatest war games ever conceived.